Bulgur has a nutty flavor, and it's a lovely addition to the tastes in this recipe that include tomatoes, fresh parsley, and fresh basil. Keep your fresh tomatoes for salads and use canned tomatoes with their juice for the stuffing, and dress up your table with color choosing the bell pepper color of your choice - green, red, yellow, or orange. 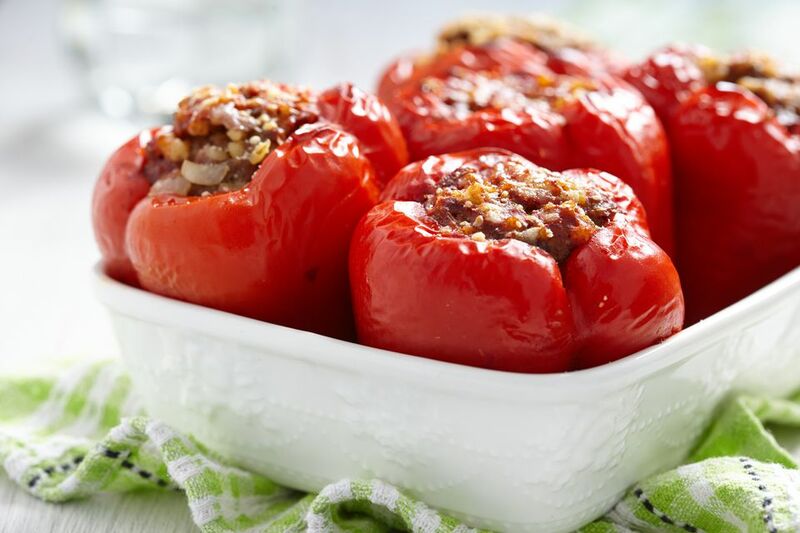 Enjoy this Greek Stuffed Peppers with Bulgur recipe! Cut a 1/2 to 3/4 inch cap off the top of the peppers. scoop out and discard seeds and any excess white pulp. Rinse well and set aside to drain. Keep the cap. In a skillet, sauté the onion in olive oil for 1-2 minutes. Add bulgur and stir to coat with oil. Stir in canned tomatoes with juice, 1 1/2 cups of water, salt, and pepper, and bring to a boil over medium heat. Cook for 10 minutes, stirring frequently. Stir in parsley and basil to distribute well and remove from heat. Let rest for 5 minutes. Preheat oven to 350°F (175-180°C). Use a teaspoon and stuff the peppers loosely to within 1/4 inch of the top. Place peppers upright in a baking dish, to fit snugly so they won't tip. Place caps on top, add 1/2 cup of water to the bottom of the dish and cook in a 350°F (175-180°C) oven for 1 hour 15 minutes, or until the peppers have softened to your preference. Allow to cool, and serve. Stuffed peppers are generally enjoyed at room temperature. Note: If the caps start to get too dark, cover the dish loosely with foil for the remainder of cooking time. Serving Suggestion: Delicious with a side of feta cheese and some ​crusty country bread. Baking Pan Size: If your baking dish is too large, place peppers snugly at one end of the dish and crumple up some baking parchment paper to fill the empty space so that the peppers will stay upright during cooking. The parchment paper won't affect the taste.